The innovative endoscopic surgical methods of joimax® offer you and your patients state-of-the-art treatment options for a broad range of indications. All of the minimally invasive procedures are performed by using HD-endoscopes: the surgeon inserts the endoscope through a small incision which allows access to the surgical field and direct visualization of the nerve roots. As the surgeon progressively dilates the access through the soft tissue and muscles the problem area can be treated very gently, using instruments with ramping up diameters, and with minimal adverse effect on the surrounding structures. 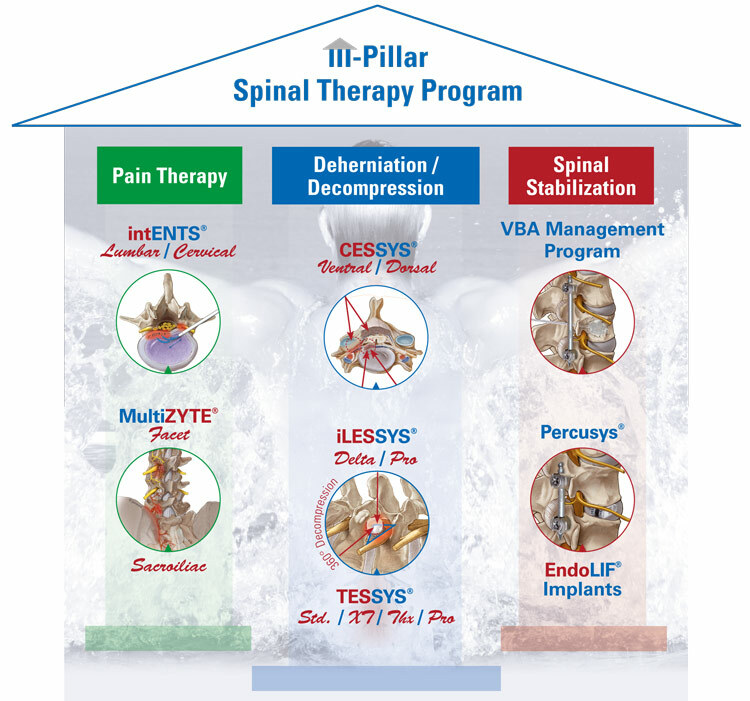 The joimax® product portfolio is based on 3 pillars covering decompression / deherniation, pain therapy and stabilization methods. Endoscopic spine surgery rises significantly and is becoming more and more state-of-the-art. Depending on the severity of the patients´ complaints different stages of treatment can be applied (see right figure below).  The qualified and standardized joimax® Training Program supports the basic principle of medicine – safe and effective treatment according to the current level of technology and scientific progress. The operation is performed with minimal trauma to any surrounding tissue, as muscles, ligaments and tendons need not be disrupted. 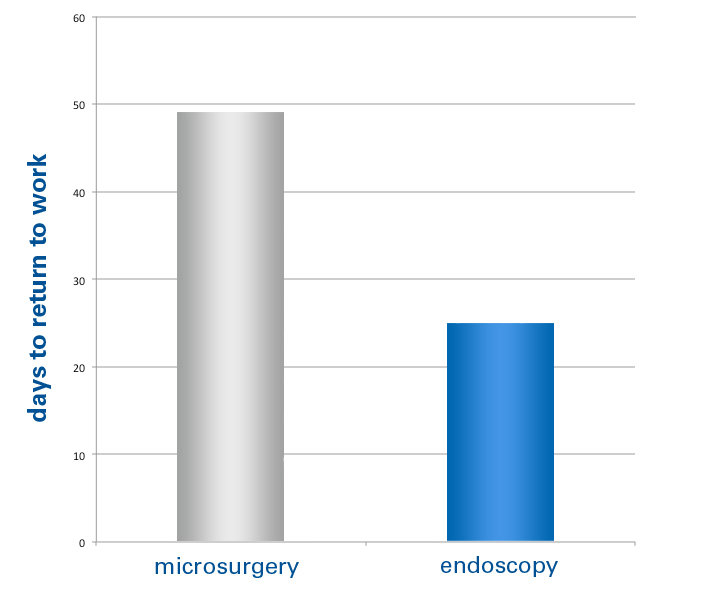 Faster recovery of the patient: Clinical studies have shown a quicker return to work1,2 after endoscopic disc surgery. In the current economic climate, patients are interested in returning to work as quickly as possible. 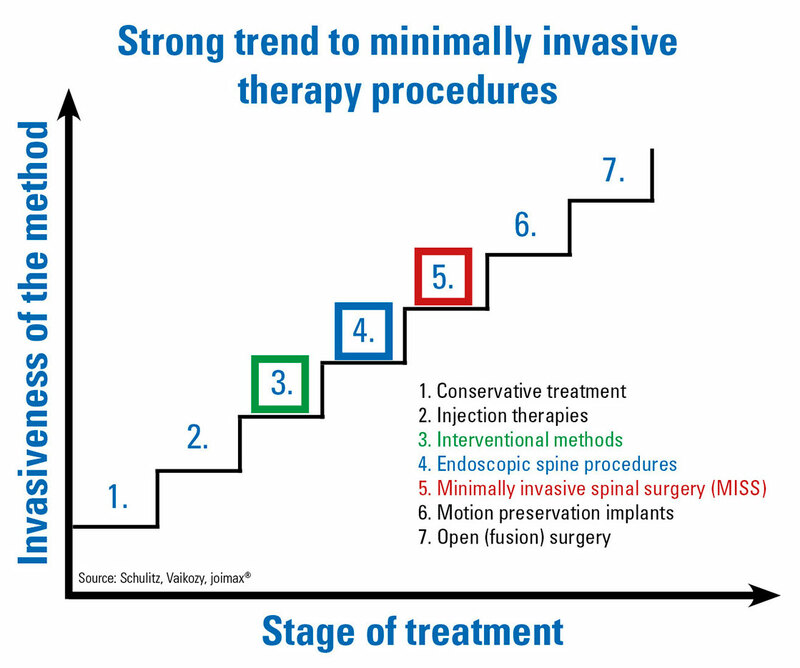 So the advantages perceived by the patient might possibly lead to an increase of patient numbers and referrals when offering this kind of minimally invasive spine surgery procedures. Patients require much less anesthesia during minimally invasive surgeries or even can be treated with analgesic sedation – so the patient is conscious during surgery and the surgeon is able to see directly the patient’s reaction to possible pain. Sophisticated technology “Made in Germany”: Optimal visualization of the surgical field in HD quality; throughout the operation the camera at the end of the endoscope provides large-scale images of the operative field allowing the surgeon to perform the surgery through a minor incision while watching it on the monitor. Especially adapted instrumentation developed in close cooperation with experienced surgeons. 1. Molyneux S, Spens HJ, Gibson A. Transforaminal Endoscopic or Micro-Discectomy – Early Results of a Randomized Controlled Trial. Proceedings of Britspine. 2010. 2. Ruetten S, Komp M, Merk H, Godolias G. Full-endoscopic interlaminar and transforaminal lumbar discectomy versus conventional microsurgical technique: a prospective, randomized, controlled study. Spine. 2008;33(9):931.